This theme provides four free templates for quick building page-flipping book. Special star space backgrounds make the flash book more attractive and unique. 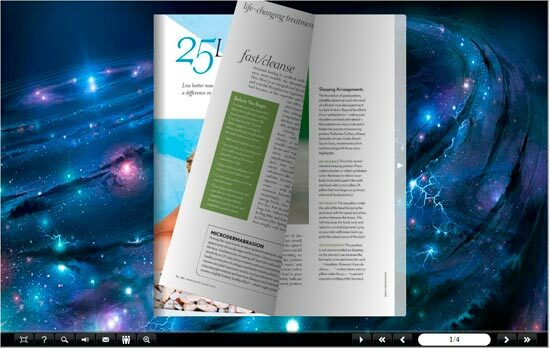 You can quick build page-flip book within several seconds with these templates. This Theme STAR describes the mysterious starry sky, every templates shows the different pattern magnificent and splendid. After sign that the space is endless, you would find that the page-flipping book enclosed by the immense background of star space become charming. You can easily install the templates in the built-in templates panel and then apply them to your PDF flipbook without any complex operations. With several seconds, you can create a professional page-flipping product catalog, magazine, book, comic, etc.